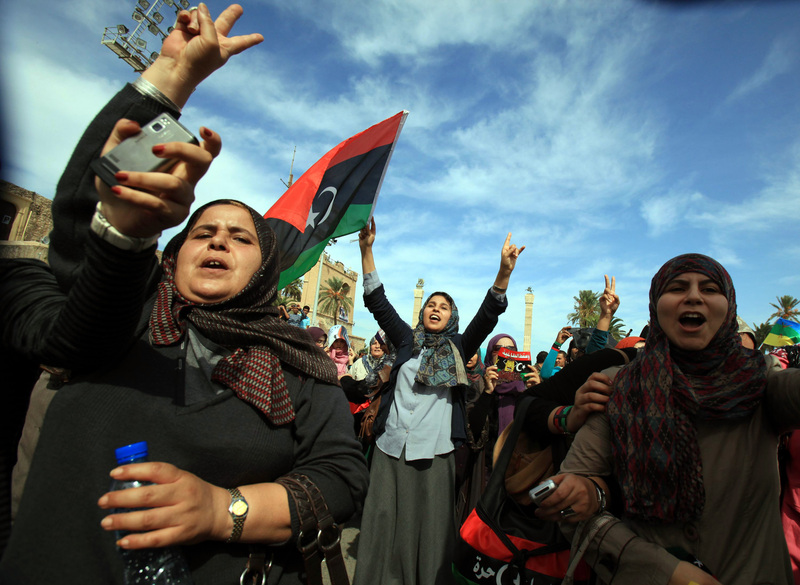 The news of Muammar Qaddafi's death was met with jubilation throughout Libya. Celebratory gunfire and cries of "Allahu Akbar" or "God is Great" rang out across the capital city of Tripoli as the reports spread. Cars honked their horns and people hugged each other. In Sirte, the ecstatic former rebels celebrated the city's fall after weeks of bloody siege by firing endless rounds into the sky, pumping their guns, knives and even a meat cleaver in the air and singing the national anthem. Qaddafi, who ruled Libya with a dictatorial grip for 42 years until he was ousted by his own people in an uprising that turned into a bloody civil war, was killed Thursday when revolutionary forces overwhelmed his hometown, Sirte, the last major bastion of resistance two months after his regime fell. Reporting from Tripoli, CBS News' Kitty Logan said residents in the capital city were euphoric after hearing the news. "Many people suffered for a long time under Colonel Qaddafi. Their relatives were imprisoned or killed. He really had a very strong dictatorial rule and the past eight months has been about removing him from power," Logan said. "Two months ago when Libya fell, they knew where he'd gone. Now they know for sure he is out the way, that he's gone, and this is really a time now for huge celebration in the capital Tripoli." Meanwhile, in a statement, the current rebel government of Libya, the National Transitional Council, lauded the "the end of tyranny and dictatorship in Libya." "I welcome everybody at this historical moment. I would like to announce to our sons and daughters and to entire world the following news: the news of the end of tyranny and dictatorship in Libya that never return again, after our revolutionaries managed to get the head of the tyrant [Qaddafi], who has met his fate and destiny like all dictators and tyrants," NTC's vice chairman, Abdel Hafiz Hoga said in a statement. "I'm announcing to the world the killing of Qaddafi by the hands of the revolutionaries and the chapter of Qaddafi and his tyranny has been closed." "We have been waiting for this moment for a long time. Muammar Qaddafi has been killed," Prime Minister Mahmoud Jibril told a news conference in Tripoli. The emotional reactions to Qaddafi's death were not confined to Libya. In New Jersey, Susan Cohen, whose 20-year-old daughter Theodora was killed in the Pan Am 103 bombing over Scotland in 1988, said she's going out to buy a bottle of expensive champagne to celebrate. Kara Weipz, whose 20-year-old brother was a Syracuse University student aboard the flight, said she was shocked. The Mount Laurel resident said the world is a better and safer place without Qaddafi. Weipz said she hopes Qaddafi left behind evidence of Libya's involvement in the bombing that claimed all 259 aboard and 11 on the ground. Initial reports from fighters said Gadhafi had been barricaded in with his heavily armed loyalists in the last few buildings they held in his Mediterranean coastal hometown of Sirte, furiously battling with revolutionary fighters closing in on them Thursday. At one point, a convoy tried to flee the area and was blasted by NATO airstrikes, though it was not clear if Gadhafi was in the vehicles. Details of his death remained unverified.